Already for the 15th time, the roof of Vienna’s Mainlibrary at the Gürtel will again be transformed into the highest open-air cinema in Vienna. Austrian productions are on the program as well as blockbusters, science fiction and film classics. Films partly German, partly original with subtitles. 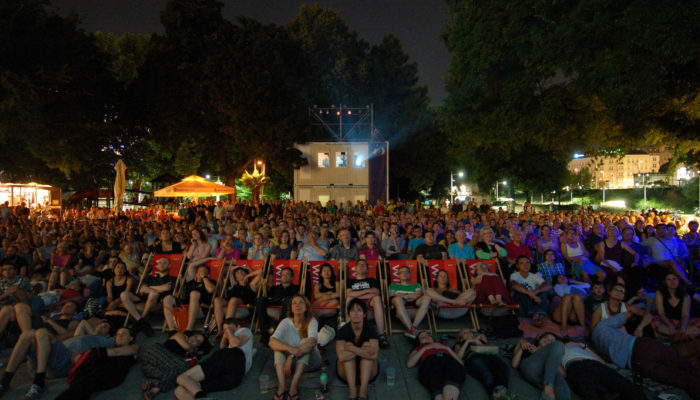 Probably the most unusual, because the only traveling open-air cinema in Vienna is the “Volxkino” to find this place on changing locations between municipal buildings, Viennese markets, parks or metro stations this year for the 29th time! Shown are Austrian and international feature films, documentaries, short films and animated films. One of the most beautiful open-air cinemas in Vienna, the “cinema like never before” is located in the middle of the Viennese Augarten and celebrates its 20th anniversary this year. The program includes classics as well as current productions. A special is dedicated to the deceased director and Oscar winner Milos Forman. The Cinema Sessions set classic silent films to music with extraordinary live music. Also in attendance is a “mobile film competition”. Culinary delights in organic quality of the “Grüner Gartenküche” complete the offer. Films in OV with German or English subtitles. After a year’s break, the “Kino unter Sternen” at the Karlskirche celebrates a comeback this year. Under the open sky and at free entrance the emphasis lies with Austrian films and dedicates itself this year to the “stranger”. In the immediate vicinity of the hotel, every Thursday & Friday in the Garden Folklore Museum, the short film festival takes place in the open air again. In addition to the short films, the program also includes film talks with international guests, workshops and performances. In case of bad weather in the Great Hall of the museum. A colorful mix of movies shows in the immediate vicinity of our hotel the “Silent Cinema” at the university campus (Altes AKH). Every Monday as a special “Science Fiction” and every Thursday the best films from the “80 and 90 years” – each visitor receives its own headphones and has the choice of the bilingual sound, either in German or English OV. "Such a friendly hotel and helpful"